Chen Kun’s (陈坤) television comeback is going to be a big one. Ten years after starring in his last television drama, the Chinese superstar is back with the all-new period drama The Rise of Phoenixes <天盛长歌>, a collaboration with Netflix. Starring alongside Chen Kun is film actress Ni Ni (倪妮) in her debut television drama. The Rise of Phoenixes is loosely based on the novel Huang Quan <凰权> by Tianxia Guiyuan (天下归元), who also wrote the novel behind the television drama Legend of Fuyao <扶摇>. 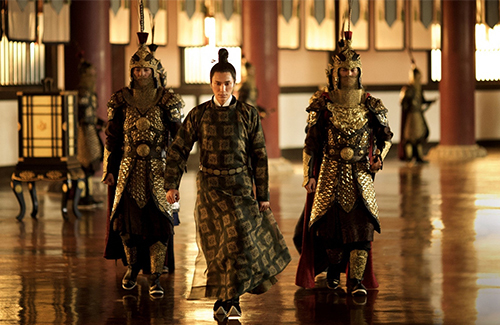 It stars Chen Kun as Ning Yi, the sixth prince of the Tiansheng Kingdom. Behind his carefree facade is an ambitious and calculating man who is plotting to avenge his fallen brother. Ni Ni plays Feng Zhiwei, who disguises herself as a man to study at the Qingming Academy. Winning court officials with her intelligence and wit, she becomes a politician for the Tiansheng Kingdom and befriends Ning Yi. Their relationship suffers when she discovers that she is the heiress of a fallen kingdom, and that Ning Yi and the court may have had a hand in destroying it. The 70-episode drama is directed by Shen Yan (沈严) and Liu Haibo (刘海波), the directors of Chinese Style Relationship <中国式关系>. Costume designer is the Oscar-nominated William Chang (張叔平), who is known for his collaborations with Wong Kar-wai (王家衛). The Rise of Phoenixes premiered on China’s Hunan TV on August 14, 2018. It will premiere on Netflix on September 14, 2018. 15 episodes will go live every Friday.